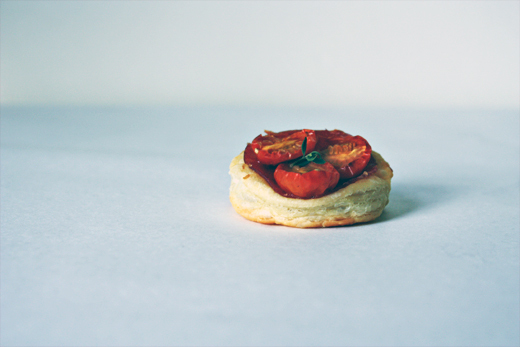 These tiny tarts are delicious and quick and people get very excited about them, which is the best kind of summer party cooking. 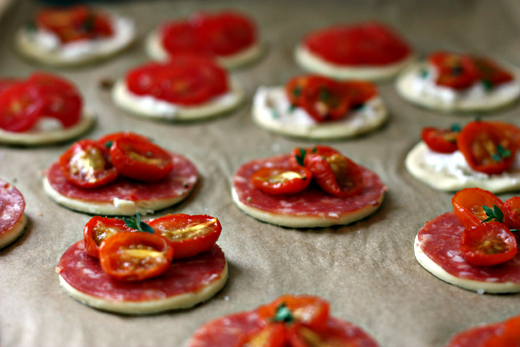 * Salami & roast cherry tomato: I cut the salami to the same size as the pastry with the same cookie cutter. I cut the cherry tomatoes in half and roasted them for about half an hour before arranging them on top of the salami with a few thyme leaves. * Goat's cheese & roast cherry tomato: I mixed some soft goat's cheese with a little salt and pepper and some thyme leaves, and topped with roast cherry tomatoes. 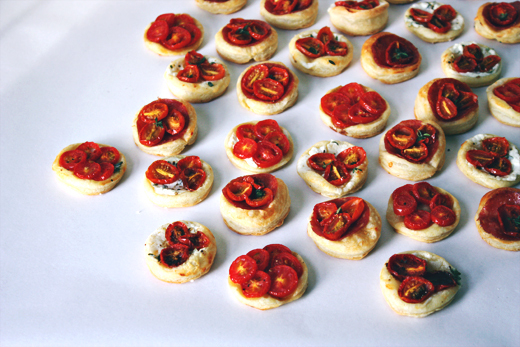 * Sweet cherry tomato: I didn't pre-roast these cherry tomatoes - instead, I cut them across-ways into small, round slices. I put a tiny bit of brown sugar on top of the pastry, then arranged the round slices of tomato in a circle and sprinkled with salt and pepper. I think these were my favourite flavour - the tomatoes stay quite firm and fresh, just beginning to melt, and the sticky sugar gives just the right hit of sweet. You can see one in the lower right hand corner of my last photo. I baked them all on top of parchment paper in a 400°F / 200°C / Gas Mark 6 oven for about 25 minutes. These sound great and I love how easy they are to make! I'm making them for sure at my next little party. Lovely! What a great party idea. I make goat cheese and caramelize onion tarts sometimes, I bet they would work well on tiny tarts. Jeez these look good. Can I come to one of your cocktail parties, Philomena? These look SO GOOD! I have to second Anon. above with several "yum"'s...wow! I definitely, definitely have to try these soon! Philomena, I have a little award for you on my blog. These look absolutely lovely, but a month without posting? I love this blog, plz come back! I tried these for a last minute get together and they were amazing! Thanks. 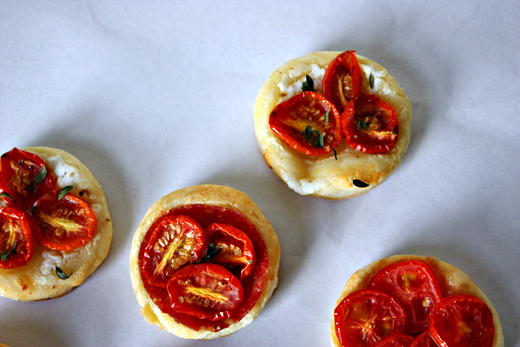 gosh, how i wish it was summer so i could make these tarts. can't wait for tomato season to return!